Giotto was an Italian painter around 1300 AD. Giotto was originally from Florence. He was born about 1265 AD. As a teenager, he may have been a student of the great painter Cimabue. It’s possible that he suffered from dwarfism. When Giotto (jee-OTT-oh) grew up, he worked mainly in fresco painting. Some of his paintings were traditional, painted on wood with gold backgrounds. 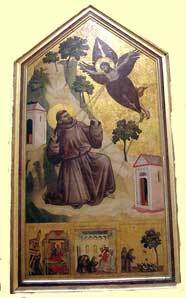 But some of Giotto’s paintings were very different from earlier medieval painting. He started to put in natural landscape backgrounds to his painting. 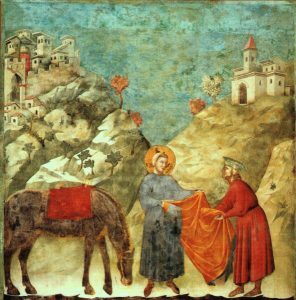 That looked very different from the plain gold backgrounds that his teacher Cimabue used. Giotto’s painting was a lot more like the paintings that Roman painters had done a thousand years earlier. Or maybe it was like Song Dynasty Chinese painting. One of Giotto’s great achievements was that he painted the inside of the Franciscan church at Assisi, near Florence, with a series of huge frescoes showing the life of Francis of Assisi, who had started the Franciscan movement. This video shows some more of Giotto’s paintings, with music by Benedictine monks (followers of Benedict). Because of his new ideas and his skill, Giotto did very well as a painter. He was able to buy land and live as a pretty well off person. He died in Florence in 1337 AD. The people of Florence buried their great artist in their new cathedral. Cite this page: Carr, K.E. Giotto in Florence and Assisi. Quatr.us Study Guides, August 1, 2017. Web. April 23, 2019.